The Board of Pensions of the PC(USA) has switched us pastor types and other church worker types to mail in prescriptions. Let me first say, that I am no lover of medical insurance. I'm glad to have it. I am fortunate to have a relatively good plan and to have my spouse covered as well. I want for nothing as far as medical treatment goes. However, I do not like people I do not know messing with my pills or my doctors visits. I have also heard about the problems of managed care from the other side - the doctor's perspective, as my father is a family practice doctor. Don't EVER get him started on the topic. You will regret it as the diatribe rages for hours and hours. I have learned not to bring up insurance, managed care, hospitals, doctor visits, medications, or anything else related to the "evil empire." All this to say that my opinions are colored and I am aware of that fact. However, I did not respond well when I received the notice that I must obtain my maintenance medication through the mail rather than my local pharmacy. If I chose to ignore the order, I'll be charged extra. This precipitated one irritated call to Express Scripts. Which lead to a visit to my local pharmacy. Which lead to another only slightly less irritated call to Express Scripts. After going around and around and being reminded once again that I was never called to be a mathematician or anything that would require even looking at numbers, I popped my prescriptions in the mail. I really had little choice. It turns out it is cheaper. I will not longer visit my local pharmacist unless I'm sick and in need of an antibiotic. My pharmacist knows me by name. He's even met my father. We chat whenever I stop by and he always asks about my family. I've lost face-to-face personal interaction. We need to be careful. I believe such loses are damaging to our souls. Speed. Express Scripts will take nearly three weeks. This will require me to stay on top of my medication in a way I have never had to do before. A severe mess up could lead to an unplanned Baby Burg! Freedom and choice. I like deciding where I'll shop and who will take care of my health needs. I have changed doctors and pharmacists more than once in search of a good match. Such options are not being limited and I resent it. The downtown emergency winter shelter is fast approaching the doors of Our Big Steeple. In just three days, forty men will find curl up on mattresses in our fellowship hall for the night. They will be warm and safe. They will be so for 29 days. Six years ago, I pulled a small group of clergy together and dreamed the shelter into existence. We did so partly to force the issue with the city. The temporary shelter attracted publicity that we hoped would finally spur the city into action. It worked. Six years later a permanent shelter is in the early (very early) stages of construction. I would be lying if didn't say I was proud. It many ways it is a dream come true. Homeless men and women are finding shelter and the city has finally had to confront an issue they had avoided for years. I helped give birth to something life-transforming. But I am done with it. I care deeply about the shelter's future but I am no longer interested in being its ringleader at Our Big Steeple. I am tired of volunteer recruitment and orientation. I am weary of sorting supplies. I deeply and passionately want to hand the shelter over. I want to celebrate its birth and move on. I believe that some people are called to giving birth and some are called to nurture. I've always thought of myself as a follower, an organizer, and one who cares for the details but I am coming to understand that I am the dreamer and the organizer. I love to bring things into being. The process is life-giving and energizing. I am not the nurturer, although I am able to so for an extended period of time if the situation allows for creativity and change. I hope this is not a weakness or an escape from responsibility. I do not believe it is. I hope and pray it is the gift I have to offer. I have begun dreaming a new dream with a member of Our Big Steeple. When we share our vision for an alternative worship service (geared towards young adults and housed in a building other than Our Big Steeple), I feel the life ooze back into my veins. My weariness subsides. I feel my spirit kick and know I'm pregnant with a new vision, a new dream. So it is my prayer that a nurturer will pick up the shelter and love it and in so doing give me the space to create something new. 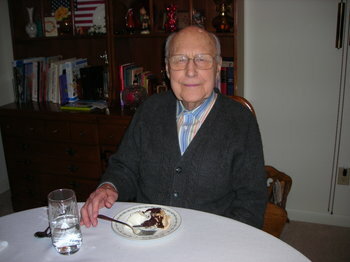 My grandfather is 94 years old today! My parents came through the Burg this weekend on their way to visit my grandparents (my dad's parents). In an effort to entertain, we took them to see a mere three movies, Atonement, Juno, and the documentary For the Bible Tells Me So. All three were excellent. My parents rarely see movies at home so love to visit our little art house theater. We are happy to indulge them. Yesterday after worship, I drove north to join my parents for the birthday celebration. My grandparents still live in their own home. Everyday my grandfather takes a walk - inside and around the basement in the winter and outside in the spring and summer. He is truly remarkable (and adorable). I can only hope I have inherited his good genes. My father arranged for members of the Penn State Blue Band to stop by for a visit. Over seventy years ago, my grandfather played a tuba in the then smaller but no less proud Blue Band. As the students sat on his couch telling stories and asking about his time in the band, my grandfather searched out his photo albums. There in black and white stood a 21 year-old version of my grandfather in a classy band uniform with a tuba wrapped around his lean frame. The students were captivated by the pictures. I stood proudly next to my grandfather pondering his lifetime. In the pictures he looks so young, so handsome, but very much the same. Its hard for me to look at pictures of my 21 year-old self and imagine my life 73 years later. I'm sure I won't be a cute as my grandfather but I hope I'm a fraction as graceful and alert and joyous. Its back. Every few months, I am slowed by knots and muscle spasms in my upper back. The last recurrence was over Thanksgiving, a few days before my sabbatical was to end. The pain ranges from annoying to almost debilitating. I'm somewhere in the middle at the moment. I can move but the pain is constant and sleeping is miserable. I'm currently wearing what looks like a feminine pad over my upper back and shoulder. Fortunately, I put on a low cut shirt this morning so half the heating feminine pad is sticking out of my shirt. Nice! There's a woman at Our Big Steeple who lives with chronic pain. Twice I have laid hands on and prayed with her. Each time I leave in awe of her spirit. She lives with a pain I cannot imagine. She is in agony and yet she smiles and hopes and keeps moving forward. I, with my upper back in knots, want to curl up in a ball (which I could not get out of at the moment) and cry. But each time the pain shoots across my back, I remember her. I know that for me this will pass and so I pray more fervently for her healing. We are hosting the rotating downtown emergency winter shelter the month of February. This means we need four volunteers a night. For reasons lodged in shelter history (I started the shelter 6 years ago so therefore carried much of the burden), volunteer recruitment was lodged in my office. It is past time for it to be moved into committee for a number of reasons. First, the congregation needs to own this ministry. Second, it is sucking me dry. Third, it is taking my time and energy away from both what I need to be doing (ie. my job description) and what is life giving or what I feel I am called to do. I felt called to help start the shelter 6 years ago, but after giving it birth, I'm feeling called to other things. I believe that process is healthy and normal and good. It is the letting go part that most of us stumble over. But volunteer recruitment will not be lodged in a committee this year. For one last winter, I am the Master of the Volunteer Calendar. Nice title, huh! I am not enjoying the work (as I said, I'm not feeling particularly called to this ministry at this time) but there are moments of grace. I called a young man from another area church last night. I had been given his name as someone who might be interested in volunteering. After I described what is required of volunteers, he wavered and then decided not to volunteer. I thanked him for considering and hung up. Fifteen minutes later the phone rang. A familiar voice said, "I talked to you 15 minutes ago. I just realized that I was about to give up an important opportunity to do good work. I need you to save me from myself and sign me up for a night." So he is volunteering Feb. 24th. But I think I shouldn't. When I calmly consider meetings, I note their importance. When not in a meeting, I believe in meetings. They provide forum for a variety of voices. I value diverse voices. They encourage community and communal decision making. I'm for community. (Who can be against community, really?!) They make space for minority opinion. I value such opinions (even when I think they are wrong). So on the surface, I should support meetings. I should rally for meetings. I should petition for more meetings, in fact. But I hate meetings. I find them boring, too long, tedious, a time waister, unproductive, and unhelpful. This does not apply to every meeting, mind you, but to most. I sat through one today. It was our big bimonthly regional church body meeting. I zoned out until we had an interesting topic to debate, but even that was painful. Too long. Mired in details and parliamentary procedure (not that parliamentary procedure isn't exceptionally helpful at times). In concept I support meetings. I practice, I detest them. So what is a girl to do? Have I been attending the wrong meetings? Is this typical of my generation (Gen X)? Do I need an attitude adjustment? Can I stop going to them? Please someone, tell me I can! Come to the Burg, Ya'll! I spent my entire holiday cleaning the house. I did have a two hour intermission for an eye exam. Unfortunately, dilated and unfocused eyes did not prevent me from seeing the dirt. The house never looks filthy but run your finger over any surface and .......well......please don't ever do that. I'd be humiliated. My parents will arrive this Thursday. My grandfather will be 94 a week from today so they are coming to see us and then surprise my grandfather. It appears I only clean for visitors. The last time I cleaned was due to another parental visit. Mrs. Rev. or Not's recent post had me wondering why I don't clean for myself. I do like a neat and tidy house. But as I scrubbed and dusted and mopped and swept, I realized that I do not like cleaning enough to make it a priority. I'd rather read a book, soak in the tub, play on the computer, drink a beer, pick my nose, or sit like a vegetable on my couch. I suggested to Dr. Burg that we get a maid. He suggested we aren't in a high enough income bracket to afford such luxuries. He may be right, but lets face it, I'm not getting it done. Maybe I need to schedule more visitors. Consider yourself invited to the Burg. We have a guest room and the house will be immaculate. Promise. You won't be imposing at all. Think of it as a favor to me and my dirty house! I've just returned from leading a spirituality retreat with a group from Our Big Steeple. The retreat was great. The setting was stunning. By grace and the astounding connections of well-connected church people, we found a house that was once the lodge for a Boy Scout Camp. The family kept the fireplace and one beam. Other than that, the entire lodge has been rebuilt and turned into a truly magnificent home. The owners live in Florida, only occasionally stopping by the "cabin" for a week long get-a-way. The house stands empty for most of the year so they allow some individuals and groups to use it for retreats, weddings, parties, etc. We were very fortunate that we knew someone who knew someone who knew the right person to get us the house. The entire home is fabulous. I hugged the kitchen counters longing for the opportunity to cook with such space, such beauty, such excess. But it was the bathrooms that stole my heart. All five rooms had their own bathroom. The showers were the surround spray kind. I now wonder how I ever managed to clean myself with only an overhead shower head! And then their were the bathtubs. My room had a huge jacuzzi tub that I believe was made especially for me - short legs and all. I spent a mere two hours soaking in the tub with a Lush Bath Bomb. I finished my book and then laid there wishing I could sleep in water. The retreat tub reminded me of other tubs that have stolen my heart. There's More Cows giant tub in her sunset bathroom. There was the tub at the Bed and Breakfast where Dr. Burg and I spent our fourth anniversary. I think it was big enough for four people (luckily we were alone). And then there was the stone waterfall tub in Kokopelli's Cave. My parents found a Bed and Breakfast literally carved into the side of a mountain in Farmington, NM. The tub was short but over 3 feet deep and fed by a waterfall shower head. It felt like bathing in a mountain stream, although warm and cozy. I have to admit I've had a bit of tub envy every time I've sunk into one of those lovely tubs, but I'm also a touch glad I do not have one. I'd waste sinful amounts of water and its unlikely I'd get anything done. Too much tub would simply be too much for a tub lover like LadyBurg. Sometimes it just is. Too much to manage emotionally and physically. Too much on the calendar. Too much invasion into what I wish were a life with Dr. Burg. But this is not unique to me so I rarely write about it. Much of it I cannot write about anyway. Let it be enough to say that I got a call from a youth uttering words I never wanted to hear in the course of my ministry. I knew I eventually would, but I wish it were not so, for the young person's sake. And I'm tired of meetings. When did ministry become about supporting the institutional structures? I often feel that my calling is buried underneath the layers of meetings and structures I'm forced to sustain. This too is not unique, but at times, I rail against the reality angry that my true gifts are lost in one more meeting where I sit with my mouth closed watching hours slowly tick by. And so, I head to another meeting with a heavy heart and no way to speak honestly of my frustration. Instead of sitting at a meeting tonight, I'd like to curl up with my book and with Dr. Burg. There hasn't been nearly enough time for self or spouse care lately. But in the midst of all the crap, there are still moments of life-giving ministry of which to be a part. So, it will be fine eventually (it always is), but right now it is too much and I'm simply tired of the pace.